Aquarium has seen little traffic, yet is an outstanding adventure for solid climbers on rock with delicate holds. Sections of perfect black rock with solid pro are interspersed with runouts, friable rock, and routefinding difficulties. 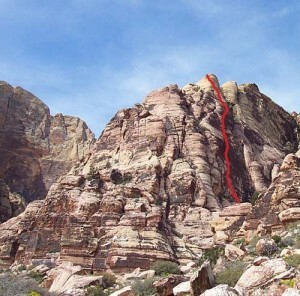 Many variations and entirely separate routes are possible on this rarely climbed piece of rock, which would in most climbing areas in the world be the most sought after wall in the area—yet in Red Rocks, it has remained undocumented and may see one ascent every few years. Which SuperTopo guidebooks include a topo for Aquarium?